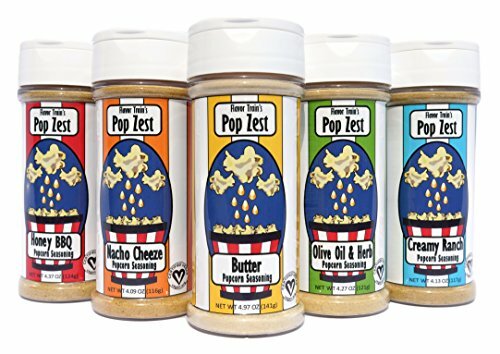 Pop Zest is the world's first flavored nutritional yeast popcorn seasoning! The Pop Zest Variety 5 Pack contains all of our signature flavors. In this pack you'll find Honey BBQ, Nacho Cheeze, Butter, Olive Oil & Herb, and Creamy Ranch. Each batch of Pop Zest is handcrafted and flavored with real herbs, spices, and plant based ingredients for a flavor punch you can feel good about. We are proudly vegan, B-vitamin fortified, and free from artificial colors, flavors and preservatives. Meet popcorn's new best friend! If you have any questions about this product by Flavor Train, contact us by completing and submitting the form below. If you are looking for a specif part number, please include it with your message.